New Hells: Which is the Right Choice for you and your Family? Composer and reed player Dan Plonsey is one of the most unique and unconventional voices in the Bay Area creative music community. High school math teacher by day, and by night a wizard of a bandleader, creating through-composed, idiosyncratic sonic worlds that sound like absolutely like nothing else, Plonsey leads the inimitable ensemble Daniel Popsicle and has collaborated on theater works with Harvey Pekar, Dandelion Dancetheater and Theatre of Yugen. 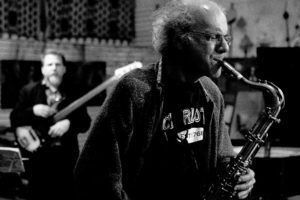 His music is nerdy and goofy, intellectually fascinating and outlandishly juvenile at once, and celebrates a special kind of musical vulnerability and ensemble collectivity. Here, a string trio and reeds duo, with special guests, perform recent works. The Best Coast Jazz Composers Series at the Center for New Music showcases the extraordinary and singular talents of some of the Bay Area’s most creative and prolific jazz artists. The series feature emerging and established composers from the Bay Area, Southern California and the Pacific Northwest, in evening-length profile concerts that explore several aspects of their diverse musical personalities, and celebrates the emergence of an eclectic, innovative and wildly creative New West Coast Sound in jazz. Curated by Bay Area bassist and composer Lisa Mezzacappa. 5: Dan Plonsey (NOISY PEOPLE) from tim perkis on Vimeo.